We always buy potatoes in bulk at a discount store and sometimes we don’t go through them as quickly as other times. Making homemade hash browns is a delicious way to use a bunch of potatoes. Whether you do a casserole or just cook them in a skillet, it’s really an easy dish that you can customize to your liking. I really like a lot of cheese on my hash browns so I usually go the casserole route. Most hash brown casseroles have sour cream in them but my wife isn’t really a fan of sour cream. I found a good recipe from Pioneer Woman that doesn’t use sour cream and that was the base I used for this recipe. She uses a bunch of different peppers in her recipe which looks really good but I don’t usually have those on hand when I want to make hash browns. She also uses frozen hash browns which will speed up the prep time but I usually have too many potatoes on hand so I like to go the fresh route. Start off by sauteing the onions and the jalapenos. You should saute them until they get translucent and start browning around the edges a bit. If you aren’t a big onion fan, I’d suggest keeping the onions regardless and just using a smaller amount or dicing very finely. Then you add the potatoes and you want to make sure to get everything mixed in together well. You should let it cook for chunks of time without messing with it so it can brown well. After each time you stir it up, you should use your spatula to flatten it back down gently. Cooking hash browns in a cast iron skillet helps get the right browning on the hash browns which can be a little harder to do on other metals without making a mess of your skillet. 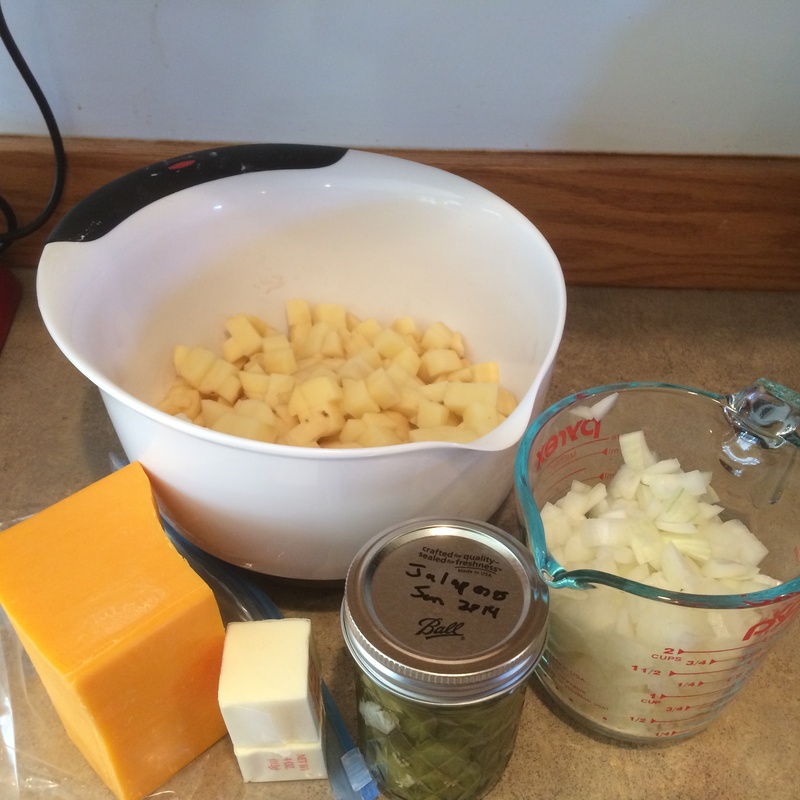 Once the potatoes are done, transfer them into a casserole dish and cover with cheese. Put them into an 350 degree oven until the cheese is melted and is bubbling around the edges. This dish also goes well with many other cheeses. Sometimes I will do a mix of cheddar and pepper jack. Remove from the oven and garnish with the parsley. Serve warm and enjoy! I’ve included the condensed recipe below. Prep all the ingredients before hand. Preheat the oven to 350 degrees Fahrenheit. Add butter and oil into a cast iron skillet and melt the butter over medium heat. 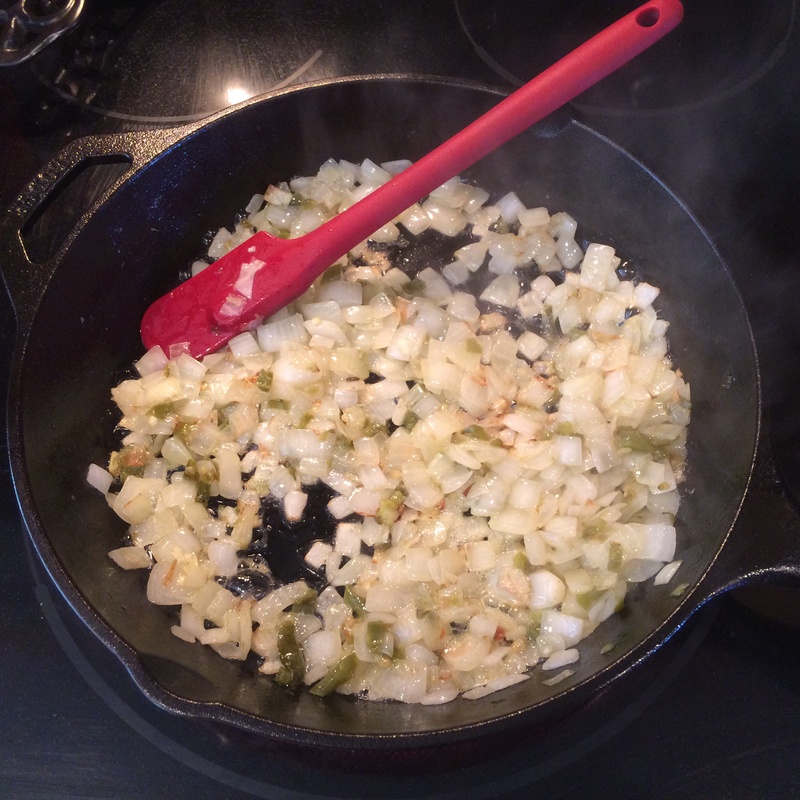 Add the onions and jalapeno and saute around 10 – 12 minutes until brown around the edges, stirring often. Add the potatoes and stir well so all the ingredients are well incorporated. Add salt and pepper to taste. I usually add about three teaspoons of Kosher salt because the potatoes really need salt, and I crack a good bit of fresh pepper over the potatoes. If the skillet looks a little too dry I’ll usually add 1 to 2 Tablespoons of olive oil to prevent the hash browns from sticking too bad. 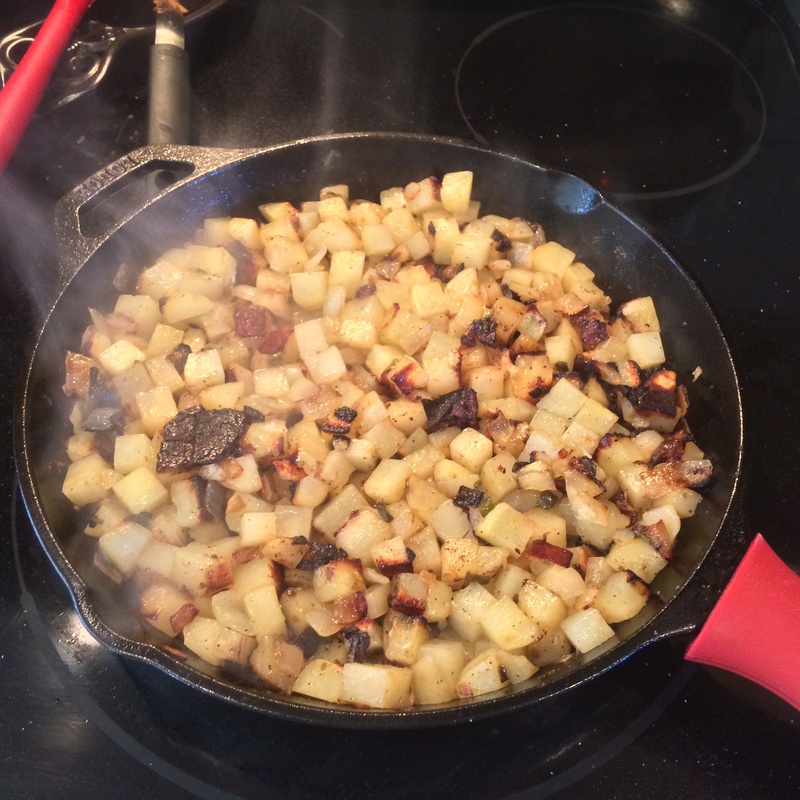 Flatten out the hash browns in the skillet with a spatula and allow to cook without stirring for five minutes. After five minutes stir up the potatoes well and flatten them out with the spatula again. Cook for another three minutes and stir and flatten again. Let cook for one more three-minute batch. The potatoes should be well browned around the edges (some will be less and some will be more). 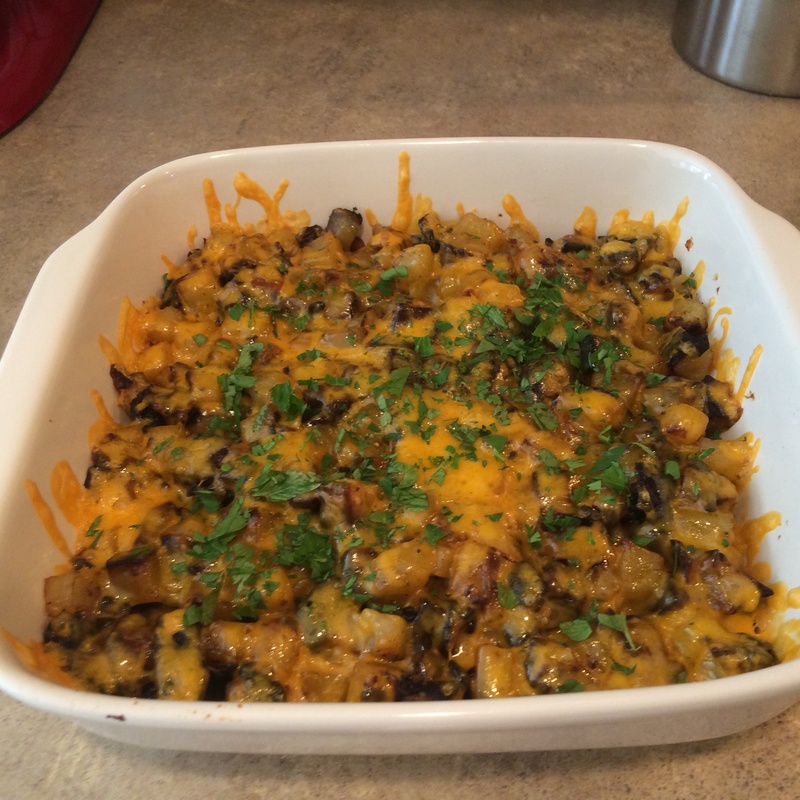 Empty the potatoes into a 9×9 casserole dish and sprinkle the cheese over evenly. 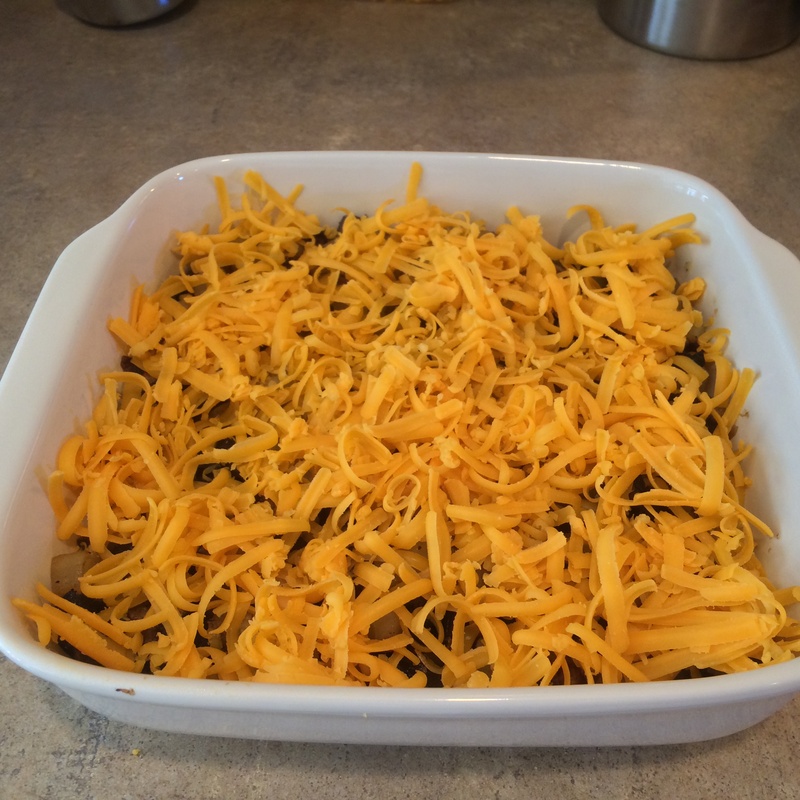 Put the casserole dish in the center rack of the oven and cook for about 15 minutes until the cheese is melted and the sides are bubbling a little. Remove from oven and sprinkle fresh parsley over the top. Serve warm. This recipe was adapted from the two recipes below.